The need for technology policy springs from an explicit commitment to a national goal and the acceptance of technology as an important strategic variable in the development process. Technology policy formulation ought to naturally follow the establishment of a development vision or perspective plan. This plan is characterized, among others, by a desired mix of the goods to be produced and services to be provided in the country in the coming one or two decades. The formulation of a technology policy begins with the establishment of a vision for the country and the corresponding scenario of the mix of goods and services to be produced and provided. The policy framework has to be broad and flexible enough, taking into account the dynamics of change. A technology policy is a comprehensive statement by the highest policy making body (Cabinet/ Parliament) in the Government to guide, promote and regulate the generation, acquisition, development and deployment of technology and science in solving national problems or achieving national objectives set forth in the development vision or perspective plan. The principal aims and objectives of a technology policy are to acquire the technology and essential technological capabilities for the production of goods and services as envisaged or set forth in the vision for the country. The policy statement includes the expression of a desire to develop a national capacity for autonomous decision-making in technological matters. The policy document includes the principles on which the envisaged technological development is to be based. Such principles include, among others, considerations of preservation and improvement of environment, satisfaction of basic needs, promotion of self-reliance, creating mass involvement, etc. · Establishment of institutional facilities for relevant knowledge dissemination and skill development for stepwise absorption of imported technology. · Provision of facilities for productive utilisation of research results and generation of indigenous technology. · Development of support facilities like information and documentation services, standardisation and quality control. · Adequate support to emerging technologies with an eye on future utilisation in production sector. · An optimal blend of indigenous and imported technology. • Policy instruments to build up S&T infrastructure; a Policy instruments to regulate technology import. • Policy instruments to define the pattern of demand for technology. • Policy instruments to promote the performance of S&T activities in the enterprises. • Policy instruments to support the performance of S&T activities. Technology policy influences the activities of different segments, agencies or departments of the government and has a direct bearing on various sectors of the economy. The formulation of a technology policy is further complicated by the necessity of its integration with the national development policy. The policy formulation mechanism would vary from country to country depending on its social values, political system and prevailing economic conditions. Technology policy formulation largely depends on the political will of the government to take the initiative. The government may ask an advisory body/committee/ministry to draft an S&T policy which may lead to an S&T Plan for integration into a national socioeconomic plan. In India the Science Advisory Council to the Prime Minister and the Cabinet are the S&T policy-making bodies. The policies are implemented through the various departments in the Ministry of Science & Technology and other S&T and Technical Departments. a) Importation, adaptation and modification of technologies produced elsewhere. b) Advancement of technology development capability ire the country. c) Creation of a climate for the acceptance of the need for technological change. 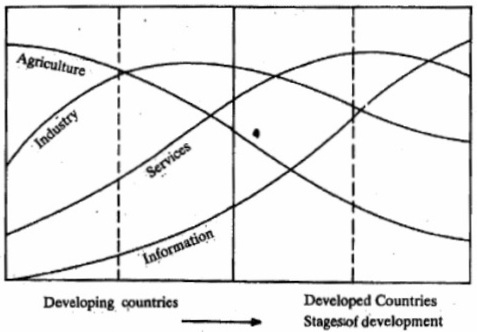 Source: Technology for Development UN-ESCAP, 1984, P26. Common procedures followed include macro level planning, micro level planning and project level planning. Several problems are normally experienced in the procedure. At the national level there is a dominant concern regarding the unemployment aspects of technological change. It is important to realise that all processes of modernisation and change result in some structural unemployment. The employment situation changes continuously with the advancement of technology (Figure-1). Therefore, it is essential to explore opportunities for achieving structural changes and expansion of the base of production facilities. a) It is essential that the planning for technology should be kept as a dynamic process. b) Shift from import substitution of consumer goods to capital goods and then import substitution of technology itself which is a difficult one and requires careful planning. c) The dimension of time is particularly critical for technology development; development of technological capabilities requires a long gestation period. d) In the early stages of development, protection of local technological efforts is essential, but this should gradually be withdrawn. e) Fostering competition and market orientation is very important for technology development. f) The will to solve one's own political and administrative problems and financial commitments at the highest national level is a necessary precondition for the preparation of any useful technology plan.